A green leaf fell from a dried nettle stalk. Seven leaves remained, drooping from a tawny stem adorned with brown globs of seeds. Some stalks held more leaves, others less. Counting staved off the damp November cold that Wednesday morning, three ridges east of the headwaters of the River Raisin, in the Year of our Lord, 1792. About an hour slipped by. 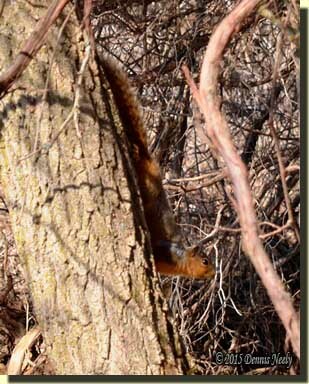 As I leaned against a red oak a fox squirrel scurried down a boxelder tree, ten paces distant. Once on the ground, the bushy-tailed tenant of the forest rummaged about in the leaves, oblivious that danger stood so near. It dug in the duff; leaves and dirt flew. It turned to its right, then burrowed deep in the leaves. Two bounds brought the squirrel closer. It searched with a vengeance, then emerged with an acorn clutched in its paws. The fox squirrel sat on its haunches with its tail curled up along its spine. Its whiskers twitched as it cut on the acorn. I waited, content to see if I, too, was a true tenant of the forest. A ways beyond, in a cluster of poplar trees, I decided to sit a spell. My left moccasin cleared an earthen nest in the leaves. I knelt in the shadows, and pulled the blanket roll, bound by a leather portage collar, over my head and placed it in the nest. The air smelled of fresh-turned earth and wet, moldy oak leaves. I sat cross-legged with my back against the biggest poplar, half-hidden behind a large oak limb that once crashed down between the two greenish-grey trunks in front of me. In a while, a mature doe meandered along the upper trail, north to south with the wind at her nose. She was about even with the poplars when I saw a long white tine on her back trail. The Northwest gun’s muzzle eased up when she looked away. The downed limb blocked her view as I lifted the frizzen to check the smoothbore’s prime. Nose down, forsaking all others, the “Big 6” followed her scent. The buck was about four-and-a-half years old with thick antler beams extending beyond his ears. Similar bucks would sport nine or ten points at his age, but not this one. He was a balanced six-pointer with two long, heavy tines and five-inch brow tines, a magnificent specimen. Despite his antler count, he was a mature, dominant sire of the herd, a buck I had not seen since early October. 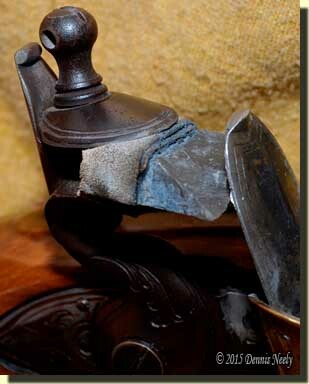 My thumb curled around the hammer’s jaw screw as the sharp English flint rose to attention. But as I removed my thumb it brushed the flint’s side. My heart sank. The flint’s outer edge skewed to the right. Out of instinct, I grasped the black beveled rock with my thumb and forefinger; it pulled free. The Northwest gun was useless. I had no choice but to sit and watch as the Big 6 sniffed south, not forty paces distant. Hunting with a smooth-bored flintlock is not without its challenges. The most often heard complaint is that a lock “klatched,” which translates to the lock failed to ignite the priming charge. The sound of a rock hitting steel without the resulting “Kla-whoosh BOOM!” is enough to coax one’s stomach into uncontrollable somersaults. If you’ve hunted with a flintlock for any amount of time, you know the feeling. To add insult to injury, klatching is the inline salesperson’s dream, another reason to tout the “unreliability of an ancient arm.” But a klatch can be caused by a number of oversights from not keeping the flint’s leading edge sharp to a loose hammer/tumbler axle fit—and a host of other maladies betwixt and between. To be fair, part of the problem was mechanical. After all, a flint lock is a somewhat complicated machine, and not all klatches are due to operator error. For example, the first half dozen outings the smoothbore klatched more than it fired—at first once or twice, but the frequency of misfires grew worse. My frustration level soared, but I tried to maintain a positive attitude as I eliminated possibilities. As a last resort, I spoke with a gunsmith at the parts kit supplier. On his advice I packed up the lock and shipped it off. As it turned out, the frizzen was soft. To a large extent, the re-hardened frizzen pushed me over that hurdle and got me back on the trail to yesteryear. I downed several ring-necked pheasants, took some squirrels and brought a rabbit or two to the pot. But I still klatched more than I thought proper. In the early years, I cut a stiff leather pad—the “clam shape” that fits the contours of the upper and lower jaws—and used it to secure the flint. But the Northwest gun’s lock is large and takes an inch-and-an-eighth flint, plus the mainspring is heavy and pounds the rock hard against the frizzen. The flint’s size coupled with the mainspring’s power did not bode well for holding a flint solid in the hammer’s jaws—and that was the next woodland classroom lesson. I tried softening the cowhide with neatsfoot oil, experimented with elk, moose and deer hide, and hammered a lead round ball flat, but nothing worked with any consistency. At the worst possible moment, like when the Big 6 sniffed after that doe, the flint would be loose, or go flying when the trigger eased the sear from the tumbler notch. Then at a gun show I saw several original Northwest trade guns on display. One had the flint wrapped in old buckskin, running side to side. The gentleman said he asked about the flint’s unusual wrapping method. The family that owned the smoothbore told him it was always that way, and to the best of their knowledge that was how their ancestor hunted with the gun. That evening I cut a deerskin strip and wrapped the flint in the same manner, using two layers top and bottom. I tried and tried to dislodge the stone, but could not; I broke a flint tapping on it with a brass hammer. In the weeks and months that followed, the English flint never came loose once. A couple years later I read Charles E. Hanson, Jr.’s “Smoothbores on the Frontier” in The Book of Buckskinning IV. Most of the guns picture had no flints in the jaws, but then I turned a page and staring square on was a later model Northwest trade gun with the flint wrapped side-to-side (Scurlock, vol. IV, pg. 116). The vast majority of late-18th-century documentation, surviving smoothbores and paintings and illustrations favors the clam-shape, leather flint pad. Each smoothbore is different, which is both a curse and a blessing, but in the case of “Old Turkey Feathers” that style flint pad proved unreliable. Thankfully, an unknown hunter hero from long ago directed me to an alternative solution, one that has served me well for three decades of gallivanting about the forest and never rendered the Northwest gun useless. 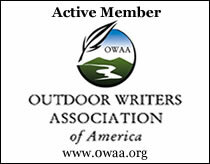 This entry was posted in Deer Hunts, Muzzleloaders and tagged Black powder hunting, Dennis Neely, historical trekking, Mountain Man, Native captive, North West trade gun, Northwest trade gun, trade gun, traditional black powder, traditional black powder hunting, traditional blackpowder, traditional blackpowder hunting, Traditional Woodsman. Bookmark the permalink. Thank you sir for this most welcome tip and thank you for the many entertaining stories and photos. You are a masterful story teller through which shines your love of the old ways and, more importantly, your respect for His creation. Jeff, I try to respond to each message as soon as I can. If you got to the home page, there is an email address under my signature.